Your Pal Archie #1 is an excellent introduction to this new and nostalgic Archie comic series. Archie has been working hard in the past few years to increase their line and their audience, and Your Pal Archie is a great addition to the mix. This series manages to hold onto the retro feel of complete short stories that made the Archie Digests famous, while also updating the characters for today’s young readers. If you are looking for a pleasant, entertaining middle ground between the new line of Archie comics and the kid-oriented digests, Your Pal Archie is the perfect fit. The first issue is a three-part comic, and I hope that future issues follow a similar structure. The first part is a short story about Jughead learning to drive. The following story is an introduction to the ongoing plot, in which Archie tries to write his own opera and win over a wealthy Veronica. These are joined by a fun, retro-style classic Betty and Veronica short. Every part feels complete and are great in their own right, but the compilation of the three different takes on Archie comics gives the feel of a classic Archie digest within a single issue. This is a great format for an all ages comic, because some young readers are not necessarily interested in collecting consecutive single issues. This format will give kids and parents the choice to pick up one issue and enjoy it, or follow the more linear story. The characters feel familiar, but are definitely updated and a little more dynamic than the traditional Archie pals. Jughead steals the show (as always), but Archie holds his own in the joke department, too. There is not a lot of Betty and Veronica action in this issue, but it’s clear that we can look forward to more of that in the future. The style of the characters is great, and their outfits are really fun. The balance between a retro Archie feel and an updated design and plot is a hard thing to get right, but this team nails it. 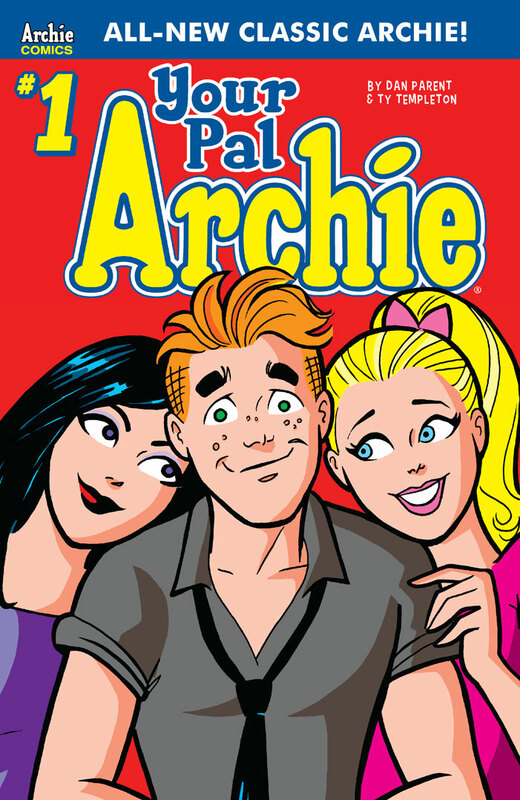 The art style is an updated version of the Archie crew, but all the characters have more expressions and individuality than usually comes through in Archie comics. Andre Szymanowicz’s colors bring a playful element to the book, especially the vibrant Riverdale sunsets and the interesting contrast between large, white gutters and full-page background colors. The best part of the two more modern stories is the panel layout. Dynamic movement, overlaid panels, and interesting shapes all work together to give an updated, fun feel to a familiar comic. This layout never would have worked in digest-size newsprint, but it is perfect for the feel of this updated Archie-verse. The transition to a retro Archie style for the Betty and Veronica backup comic is impeccable. I was surprised to realize how much of the creative team from the first two stories is responsible for the classic style comic, because the style changes so drastically. Ty Templeton’s humor shines through in both styles. Jack Morelli completely transforms his lettering style to emulate the classic Betty and Veronica books, and it brings me right back to my childhood love of Archie comics. Bringing in Bob Smith on inks and Glen Whitmore on colors completed the team, and the result is a really excellent nod to classic Archie. I can’t wait to see more. Overall, this is a fun comic, and. perfect balance between classic Archie nostalgia and modern comics. It truly is an all-ages book, and the separate stories will ensure that there is a little something for every reader. After an intense, suspenseful season of Riverdale and some more serious events in the ongoing Archie title, Your Pal Archie is the perfect, light-hearted addition to the Archie line.